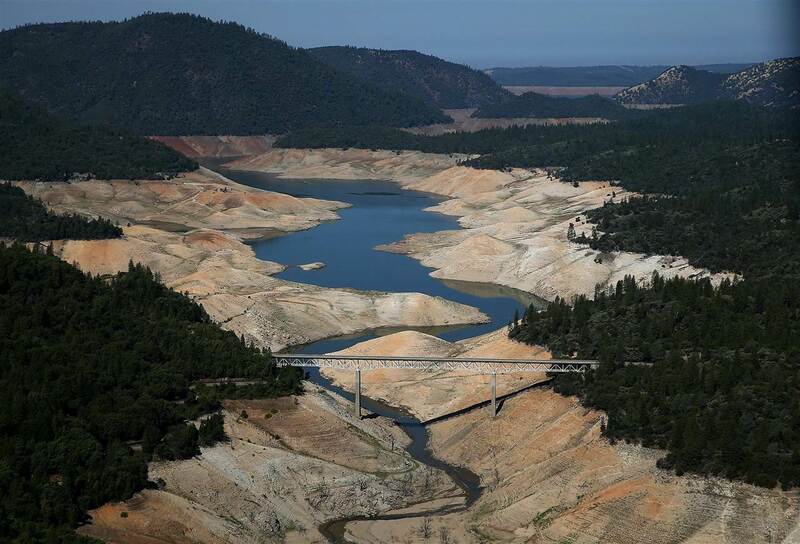 This picture of Lake Oroville in Northern California is representative of the worsening drought in California. It looks appalling but these dams and lakes are doing the job they were intended to do when they were designed. The question is, "How long can they do it?" The drought in California is getting lots of attention these days because of its large population and tremendous agricultural industry. As this map shows, California is bone dry. An outstanding Huffington Post article article by Lydia O'Connor and Chris McGonigal tells the State's full story but other areas of the west and south are also suffering and they provide a stark reminder that we need to "try something." This multi-year drought is also affecting many other heavily populated areas like Austin, Texas where the long term situation can only be described as frightening. As a native of the Austin area, I have seen the region grow so much that it's become something I no longer recognize. The region's exponential growth is driven by State Government, Universities, high tech industries and supported by abundant natural resources such as eight essential lakes that catch the flows of the following rivers... The Colorado, The San Saba, The Llano and The Pedernales. Prior to the completion of the dams that created the "Highland Lakes", Austin looked like this after a flood. 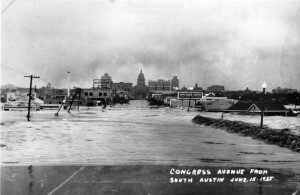 This picture shows the flood waters before cresting at the Capitol grounds in 1935. It rained 22 inches that day. There is an old saying about the rains that fall on Austin. "It usually rains over 30 inches a year but but you don't want to be in town on the day it happens." Although the lakes and dams are doing their job, lake levels are nearing historic lows of 35 percent capacity while curiously, the beneficial rains are falling down stream of the dams so the flood waters of the Colorado are ending up in the Gulf of Mexico. Here is a live webcam of a small portion of Lake Travis, the largest of the Highland Lakes which is 65 miles long. If beneficial rains continue to fall behind the dams and not on the intended watershed, the lakes will go dry. This was not anticipated when the dams were planned. It can be argued that altered rainfall patterns, whether caused by natural climate changes or pollution, are resulting in some sort of climate "weirding". According to the LCRA, the "Lower Colorado River Authority", which manages the dams, the heat evaporation of the lakes in 2012 removed 145,000 acre feet from the lakes, which equaled the amount of water actually used out of the lakes. The 145,000 "acre feet" total is a measurement of water removal that can be described as 145,000 acres of land covered in one foot of water. See the article here. Lake Mead near Las Vegas, shown in the next photo, is also in trouble. It's America's largest man made reservoir and it was formed by Hoover Dam. This giant lake has dropped by 130 feet since 2001 and 30 feet in just one year. It faces an uncertain future, as do the states it serves. 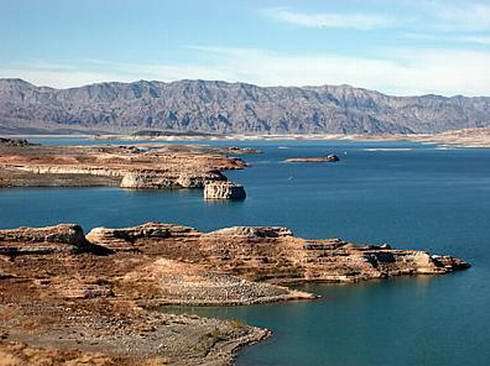 In addition to serving Las Vegas, water from Lake Mead needs to reach California, Arizona, Colorado, New Mexico, other parts of Nevada, Utah, Wyoming and part of Mexico. These regions get allotments which date back to the Colorado River Compact of 1922. The lake serves 40 million people and 4 million acres of farm land. The men and women who understood the need for these massive public works projects were visionaries. They were not ideologically opposed to using the collective resources of government to make big things happen. Sadly, too few of these people are at the helm of Government today. Why do we keep lawns and golf courses green and lush while our water reservoirs reach critical lows? Why are we forcing farmers to thin out their productive trees and curtail food production instead of providing them with the financial resources to invest in the most efficient irrigation systems? Why are we sitting on our hands when we should be building thousands of smaller, localized storm capture reservoirs? Why are we doing nothing? We can only conclude that voters are electing too many affable dunces to local, State and national office who lack the intelligence and vision to lead during a crisis. Most of the people we elect are just "nice" folks. We can relate to them. They tell us what we want to hear. They try to please us like trained animals please their trainers in order to receive a treat or accolade, which in human political terms is always votes and money. Moreover, these elected leaders make us feel good about ourselves because they possess all our flaws and like too many of us, lack the intellectual prowess to lead. In fact they are like us in too many ways. They are nothing but followers. They are extracts of us, distilled down to the essence of the stupefied masses they represent. They are about as capable of offering leadership and solutions in the 21st century as a trained pet. At the risk of sounding pretentious, let me separate myself for long enough to offer solutions. This is not my attempt to step over this heap but to dig a path out of it, as one would do if buried in debris. We must develop a master plan to bring flood waters from the Mississippi and the Missouri Rivers to points west and south. This requires a massive public works project that must be coupled with the use of our Great Lakes, by creating giant water pipelines to provide drinking water to the major cities in the south and west. These can all be powered by solar and natural gas. See example here. We must build desalination plants across the Gulf and west coast to supplement municipalities and restore depleted reservoirs. We must build land based mass travel systems like high speed rail and get thousands of planes out of the sky that add massive amount of pollution. See this plan. Most importantly, we must build thousands of localized storm capture reservoirs to prevent excess flood waters from ending up in the Atlantic and the Pacific oceans. Our nation can't afford to risk a future where we look back at this time and regret our failure to act. Nothing suggested here is rocket science. It simply takes vision, commitment and leadership, which sadly, are resources in short supply in the United States.